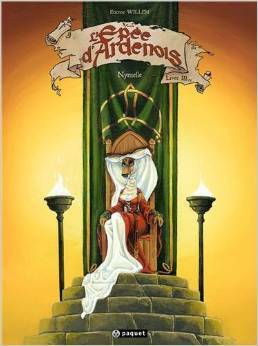 Incidentally, author/artist Willem has said in interviews that The Sword of Ardenois is his homage to all of the Medieval-setting talking-animal fantasies that have influenced him; notably the medieval Roman de Renard, the Disney 1973 anthropomorphic-animal Robin Hood animated film, and Brian Jacques’ Redwall novels. The Sword of Ardenois is more complex and grim than any of them. As volume 3 begins, Garen seethes at not being taken seriously. (I’M ALMOST GROWN UP!”) The Kingdom of Bohan, the leader in the past war against Lord Nuhy, is now under King Tancred the Younger (lynx), son of the recently deceased Tancred the Elder. Nobody knows whether he is the strong leader that his father was, and it looks like they will not give him time to prove himself. The current ruler of Valdor, Count-Bishop Egbert (vulture), refuses to join a new alliance against Nuhy, trusting more in Valdor’s strong fortifications for safety. Wolf (wolf), the son of Valdor’s former lord who fled to Bohan’s court after his father was overthrown by Egbert, offers Tancred Valdor’s support if Tancred will support him against Egbert. Tancred is tempted, but is aware that the last thing he needs is to get involved in a civil war in Valdor while Nuhy’s armies under Hellequin are invading. Welcome to the world of 12th-14th-century European court politics. The warriors in Fort de la Lanterne behind the Wall of Ambrosius decide to venture past the Wall to the defense of Bohan’s capital of Oddenburg, under the leadership of Lord Arthus. It looks like Garen will finally get to fight. But Arthus sends him to safety again! He orders Garen to “protect” ancient Maugus the wizard (owl), who is going on a “secret mission” out of trouble. Nobody suspects that he has a real secret mission that Maugus believes that nobody knows about, but that Hellebore and his dark magic is personally waiting for him – and Garen. To be concluded in volume 4, Nuhy. Yarst! I can’t figure any way to mention Dame Nymelle (deer), whom this volume is named after, without giving away major spoilers. She is very important to the plot, though. L’Epée d’Ardenois is excellent in both its artwork and its feel of the genuine complexity of Medieval politics. In fact, that may be one reason why it hasn’t been translated into English yet; not that it is too difficult to translate, but that its convoluted politics are too Machiavellian for a “funny animal comic book”. The series is very highly recommended, for furry fans and for fans of the real politics of the Age of Knights. As with volumes 1 & 2, volume 3 is offered in two editions; the finished, full-color edition, and a pencil-sketch (crayonnée) edition of Willem’s uncolored line art. The crayonnée edition is €25.00, limited to 1,300 numbered copies. The cover features La Fouine.